The British Aerospace Sea Harrier is a naval short take-off and vertical landing/vertical take-off and landing jet fighter, reconnaissance and attack aircraft; the second member of the Harrier Jump Jet family developed. It first entered service with the Royal Navy in April 1980 as the Sea Harrier FRS1 and became informally known as the "Shar". Unusual in an era in which most naval and land-based air superiority fighters were large and supersonic, the principal role of the subsonic Sea Harrier was to provide air defence for Royal Navy task groups centred around the aircraft carriers. The Sea Harrier served in the Falklands War, and the Balkans conflicts; on all occasions it mainly operated from aircraft carriers positioned within the conflict zone. Its usage in the Falklands War was its most high profile and important success, when it was the only fixed-wing fighter available to protect the British Task Force. The Sea Harriers shot down 20 enemy aircraft during the conflict; 2 Sea Harriers were lost to enemy ground fire. They were also used to launch ground attacks in the same manner as the Harriers operated by the Royal Air Force. The Sea Harrier was marketed for sales abroad, but by 1983 India was the only operator other than Britain after attempts to sell the aircraft to Argentina and Australia were unsuccessful. A second, updated version for the Royal Navy was made in 1993 as the Sea Harrier FA2, improving its air-to-air abilities and weapons compatibilities, along with a more powerful engine; this version continued manufacture until 1998. The aircraft was withdrawn from service early by the Royal Navy in 2006. The Sea Harrier remained in service for a further decade with the Indian Navy until its retirement in 2016. In the post-war era, the Royal Navy began contracting in parallel with the break-up of the British Empire overseas and the emergence of the Commonwealth of Nations, reducing the need for a larger navy. By 1960, the last battleship, HMS Vanguard, was retired from the Navy, having been in service for less than fifteen years. Perhaps the biggest sign of the new trend towards naval austerity came in 1966, when the planned CVA-01 class of large aircraft carriers destined for the Royal Navy was cancelled. During this time, requirements within the Royal Navy began to form for a vertical and/or short take-off and landing (V/STOL) carrier-based interceptor to replace the de Havilland Sea Vixen. Afterward, the first V/STOL tests on a ship began with a Hawker Siddeley P.1127 landing on HMS Ark Royal in 1963. A second concept for the future of naval aviation emerged in the early 1970s as the first of a new class of "through deck cruisers" was planned. These were very carefully and politically designated as cruisers to deliberately avoid the term "aircraft carrier", in order to increase the chances of funding from a hostile political climate against expensive capital ships, they were considerably smaller than the previously sought CVA-01. These ships were ordered as the Invincible class in 1973, and are now popularly recognised as aircraft carriers. Almost immediately upon their construction, a ski-jump was added to the end of the 170-metre deck, enabling the carriers to effectively operate a small number of V/STOL jets. The Royal Air Force's Hawker Siddeley Harrier GR1s had entered service in April 1969. A navalised variant of the Harrier was developed by Hawker Siddeley to serve on the upcoming ships; this became the Sea Harrier. In 1975, the Royal Navy ordered 24 Sea Harrier FRS.1 (standing for 'Fighter, Reconnaissance, Strike') aircraft, the first of which entered service in 1978. During this time Hawker Siddeley became part of British Aerospace through nationalisation in 1977. By the time the prototype Sea Harrier was flown at Dunsfold on 20 August 1978 the order had been increased to 34. The Sea Harrier was declared operational in 1981 on board the first Invincible class ship HMS Invincible, and further aircraft joined the ageing HMS Hermes aircraft carrier later that year. Following their key role in the 1982 Falklands War, several lessons were learned from the aircraft's performance, which led to approval for an upgrade of the fleet to FRS.2 (later known as FA2) standard to be given in 1984. The first flight of the prototype took place in September 1988 and a contract was signed for 29 upgraded aircraft in December that year. In 1990, the Navy ordered 18 new-build FA2s, at a unit cost of around £12 million, four further upgraded aircraft were ordered in 1994. The first aircraft was delivered on 2 April 1993. Locations of the four nozzles at the sides of the Pegasus engine. The Sea Harrier is a subsonic aircraft designed to fill strike, reconnaissance and fighter roles. It features a single Rolls-Royce Pegasus turbofan engine with two intakes and four vectorable nozzles. It has two landing gear on the fuselage and two outrigger landing gear on the wings. The Sea Harrier is equipped with four wing and three fuselage pylons for carrying weapons and external fuel tanks. Use of the ski jump allowed the aircraft to take off from a short flight deck with a heavier loadout than otherwise possible, although it can also take off like a conventional loaded fighter without thrust vectoring from a normal airport runway. The Sea Harrier was largely based on the Harrier GR3, but was modified to have a raised cockpit with a "bubble" canopy for greater visibility, and an extended forward fuselage to accommodate the Ferranti Blue Fox radar. Parts were changed to use corrosion resistant alloys or coatings were added to protect against the marine environment. After the Falklands War, the Sea Harrier was fitted with the new anti-ship Sea Eagle missile. The Sea Harrier FA2 featured the Blue Vixen radar, which was described as one of the most advanced pulse doppler radar systems in the world; the Blue Fox radar was seen by some critics as having comparatively low performance for what was available at the time of procurement. The Blue Vixen formed the basis for development of the Eurofighter Typhoon's CAPTOR radar. The Sea Harrier FA2 also carried the AIM-120 AMRAAM missile, the first UK aircraft to be provided with this capability. An upgraded model of the Pegasus engine, the Pegasus Mk 106, was used in the Sea Harrier FA2; in response to the threat of radar-based anti aircraft weapons electronic countermeasures were added. Other improvements included an increase to the air-to-air weapons load, look-down radar, increased range, and improved cockpit displays. The cockpit in the Sea Harrier includes a conventional centre stick arrangement and left-hand throttle. In addition to normal flight controls, the Harrier has a lever for controlling the direction of the four vectorable nozzles. The nozzles point rearward with the lever in the forward position for horizontal flight. With the lever back, the nozzles point downward for vertical takeoff or landing. The usefulness of the vertical landing capability of the Sea Harrier was demonstrated in an incident on 6 June 1983, when Sub Lieutenant Ian Watson lost contact with the aircraft carrier HMS Illustrious and had to land Sea Harrier ZA176 on the foredeck of the Spanish cargo ship Alraigo. In 1998, the UK Defence Evaluation and Research Agency test-fitted an FA2 with AVPRO UK Ltd's Exint pods, small underwing compartments intended to be used for deployment of special forces. In 2005, although already timetabled to be retired, a Sea Harrier was modified with an 'Autoland' system to allow the fighter to perform a safe vertical landing without any pilot interaction. Despite the pitching of a ship posing a natural problem, the system was designed to be aware of such data, and successfully performed a landing at sea in May 2005. The first three Sea Harriers were a development batch and were used for clearance trials. The first production aircraft was delivered to RNAS Yeovilton in 1979 to form an Intensive Flying Trials Unit (also known as 700A Naval Air Squadron). In March 1980 the Intensive Flying Trials Unit became 899 Naval Air Squadron and would act as the landborne headquarters unit for the type. The first operational squadron 800 Naval Air Squadron was also formed in March 1980 initially to operate from HMS Invincible before it transferred to HMS Hermes. In January 1981, a second operation squadron 801 Naval Air Squadron was formed to operate from HMS Invincible. Sea Harrier at RNAS Yeovilton. The pre-Falklands War paint scheme seen here was altered by painting over the white undersides and markings en route to the islands. Sea Harriers took part in the Falklands War of 1982, flying from the aircraft carriers HMS Invincible and HMS Hermes. The Sea Harriers performed the primary air defence role with a secondary role of ground attack; the RAF Harrier GR3 provided the main ground attack force. A total of 28 Sea Harriers and 14 Harrier GR3s were deployed in the theatre. The Sea Harrier squadrons shot down 20 Argentine aircraft in air-to-air combat with no air-to-air losses, although two Sea Harriers were lost to ground fire and four to accidents. Out of the total Argentine air losses, 28% were shot down by Harriers. One Sea Harrier alone, flown by RAF Flight Lieutenant David Morgan, shot down two Skyhawks in a single encounter. A number of factors contributed to the failure of the Argentinian fighters to shoot down a Sea Harrier. Although the Mirage III and Dagger jets were faster, the Sea Harrier was considerably more manoeuvrable. Moreover, the Harrier employed the latest AIM-9L Sidewinder missiles and the Blue Fox radar. Contrary to contemporary reports that "viffing" proved decisive in dogfights, the maneuver was not used by RN pilots in the Falklands as it was only used in emergencies against enemies unfamiliar with the aircraft. The British pilots had superior air-combat training, one manifestation of which was that they thought they noticed Argentinian pilots occasionally releasing weapons outside of their operating parameters. This is now thought to have been Mirages releasing external fuel tanks rather than weapons, and turning away from conflict with the Sea Harrier. This later reduced their capability to fight an effective campaign against the Sea Harrier due to reduced range and lack of external fuel tanks. 800 NAS Sea Harrier FRS1 from HMS Illustrious in post-Falklands War low-visibility paint scheme. British aircraft received fighter control from warships in San Carlos Water, although its effectiveness was limited by their being stationed close to the islands, which severely limited the effectiveness of their radar. The differences in tactics and training between 800 Squadron and 801 Squadron has been a point of criticism, suggesting that the losses of several ships were preventable had Sea Harriers from Hermes been used more effectively. Both sides' aircraft were operating in adverse conditions. Argentine aircraft were forced to operate from the mainland because airfields on the Falklands were only suited for propellor-driven transports. In addition, fears partly aroused by the bombing of Port Stanley airport by a British Vulcan bomber added to the Argentinians' decision to operate them from afar. As most Argentine aircraft lacked in-flight refuelling capability, they were forced to operate at the limit of their range. The Sea Harriers also had limited fuel reserves due to the tactical decision to station the British carriers out of Exocet missile range and the dispersal of the fleet. The result was that an Argentine aircraft only had five minutes over the islands to search for and attack an objective, while a Sea Harrier could stay near to 30 minutes waiting in the Argentine approach corridors and provide Combat Air Patrol coverage for up to an hour. I counted them all out, and I counted them all back. 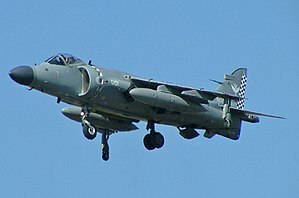 The Sea Harriers were outnumbered by the available Argentinian aircraft, and were on occasion decoyed away by the activities of the Escuadrón Fénix or civilian jet aircraft used by the Argentine Air Force. They had to operate without a fleet early warning system such as AWACS that would have been available to a full NATO fleet in which the Royal Navy had expected to operate, which was a significant weakness in the operational environment. It is now known that British units based in Chile did provide early radar warning to the Task Force. Nonetheless, the lack of AWACS cover result meant that the Sea Harriers could not establish complete air superiority and prevent Argentine attacks during day or night; nor could they completely stop the daily C-130 Hercules transports' night flights to the islands. A total of six Sea Harriers were lost during the war to either enemy fire, accidents, or mechanical failure. The total aggregate loss rate for both the Harriers and Sea Harriers on strike operations was 2.3%. The Sea Harrier saw action in war again when it was deployed in the 1992–1995 conflict in Bosnia, part of the Yugoslav Wars. It launched raids on Serb forces and provided air-support for the international taskforce units conducting Operations Deny Flight and Deliberate Force against the Army of Republika Srpska. On 16 April 1994, a Sea Harrier of the 801 Naval Air Squadron, operating from the aircraft carrier HMS Ark Royal, was brought down by a Igla-1 surface-to-air missile fired by the Army of Republika Srpska while attempting to bomb two Bosnian Serb tanks. The pilot, Lieutenant Nick Richardson, ejected and landed in territory controlled by friendly Bosnian Muslims. It was used again in the 1999 NATO campaign against the Federal Republic of Yugoslavia in Operation Allied Force, Sea Harriers which operated from HMS Invincible frequently patrolled the airspace to keep Yugoslavian MiGs on the ground. They were also deployed to Sierra Leone on board HMS Illustrious in 2000, which was itself part of a Royal Navy convoy to supply and reinforce British intervention forces in the region. The Sea Harrier was withdrawn from service in 2006 and the last remaining aircraft from 801 Naval Air Squadron were decommissioned on 29 March 2006. The plans for retirement were announced in 2002 by the Ministry of Defence. The aircraft's replacement, the F-35 Lightning II, was originally due in 2012, the MoD arguing that significant expenditure would be required to upgrade the fleet for only six years of service. By March 2010, the F-35's introduction had been pushed back to 2016 at the earliest, with the price doubled. The decision to retire the Sea Harrier early has been criticised by some officers within the military. Both versions of Harrier experienced reduced engine performance (Pegasus Mk 106 in FA2 – Mk 105 in GR7) in the higher ambient temperatures of the Middle East, which restricted the weight of payload that the Harrier could return to the carrier in 'vertical' recoveries. This was due to the safety factors associated with aircraft "land-on" weights. The option to install higher-rated Pegasus engines would not have been as straightforward as on the Harrier GR7 upgrade and would have likely been an expensive and slow process. Furthermore, the Sea Harriers were subject to a generally more hostile environment than land-based Harriers, with corrosive salt spray a particular problem. A number of aircraft were retained by the School of Flight Deck Operations at RNAS Culdrose. The Royal Navy's Fleet Air Arm would continue to share the other component of Joint Force Harrier. Harrier GR7 and the upgraded Harrier GR9 were transferred to Royal Navy squadrons in 2006, but were retired prematurely a few years later due to budget cuts. The UK plans to purchase the STOVL F-35B to be operated from the Royal Navy's Future Queen Elizabeth-class aircraft carrier. Although withdrawn from active Royal Navy service, Sea Harriers are used to train naval aircraft handlers at the Royal Navy School of Flight Deck Operations. A pair of Indian Sea Harriers fly alongside an F/A-18F Super Hornet of the U.S. Navy during Malabar 2007. In 1977, the Indian government approved of plans to acquire the Sea Harrier for the Indian Navy; prior to this, rumours reportedly were circulating of a potential Indian purchase of the Soviet V/STOL-capable Yak-36. The BAE Sea Hawk was phased out from the Indian Navy in 1978, in preparation for the purchase of Sea Harriers. In November 1979, India placed its first order for six Sea Harrier FRS Mk 51 fighters and two T Mk 60 Trainers; the first three Sea Harriers arrived at Dabolim Airport on 16 December 1983, and were inducted the same year. Ten more Sea Harriers were purchased in November 1985; eventually a total of 30 Harriers were procured, 25 for operational use and the remainder as dual-seat trainer aircraft. Until the 1990s, significant portions of pilot training was carried out in Britain due to limited aircraft availability. The introduction of the Sea Harrier allowed for the retirement of India's previous carrier fighter aircraft, the Hawker Sea Hawk, as well as for the Navy's aircraft carrier, INS Vikrant (ex-HMS Hercules), to be extensively modernised between 1987 and 1989. India has operated Sea Harriers from both the aircraft carriers INS Vikrant and INS Viraat (ex-HMS Hermes). The Sea Harrier allowed several modern missiles to be introduced into naval operations, such as the British anti-ship Sea Eagle missile, and the French Matra Magic missile for air-to-air combat. Other ordnance has included 68 mm rockets, runway-denial bombs, cluster bombs, and podded 30 mm cannons. There have been a significant number of accidents involving the Sea Harrier; this accident rate has caused approximately half the fleet to be lost with only 11 fighters remaining in service. Following a crash in August 2009, all Sea Harriers were temporarily grounded for inspection. Since the beginning of operational service in the Indian Navy, seven pilots have died in 17 crashes involving the Sea Harrier, usually during routine sorties. In 2006, the Indian Navy expressed interest in acquiring up to eight of the Royal Navy's recently retired Sea Harrier FA2s in order to maintain their operational Sea Harrier fleet. Neither the Sea Harrier FA2's Blue Vixen radar, the radar warning receiver or AMRAAM capability was proposed to be included; certain US software would be also be uninstalled prior to shipment. By October 2006, reports emerged that the deal had not materialised due to the cost of airframe refurbishment. In 2006, the Indian Navy started upgrading up to 15 Sea Harriers in collaboration with Israel by installing the Elta EL/M-2032 radar and the Rafael 'Derby' medium-range air-to-air BVR missile. This enabled the Sea Harrier to remain in Indian service beyond 2012, and also see limited service off the new carriers it planned to acquire by that time. By 2009, crashes had reduced India's fleet to 12 (from original 30). India plans to introduce larger aircraft carriers that can operate Russian MiG-29K carrier fighters from their flight decks to replace the Sea Harrier. The Sea Harriers operated from INS Viraat for the last time on 6 March 2016. On 11 May 2016, a ceremony was held at INS Hansa, Dabolim, Goa to commemorate the phasing out of Sea Harriers from INAS 300 ("White Tigers"). Sea Harriers and MiG 29Ks performed an air display at the ceremony, marking the final flight of the Sea Harriers in the Indian Navy. INAS 300 subsequently introduced MiG 29K/Kub fighters to replace the retired Sea Harrier fleet. 57 FRS1s were delivered between 1978 and 1988; most survivors converted to Sea Harrier FA2 specifications from 1988. Single-seat fighter, reconnaissance, and attack aircraft made for the Indian Navy, similar to the British FRS1. Unlike the FRS1 Sea Harrier, it is fitted with Matra R550 Magic air-to-air missiles. These aircraft were later upgraded with the Elta EL/M-2032 radar and the Rafael Derby BVRAAM missiles. Upgrade of FRS1 fleet in 1988, featuring the Blue Vixen Pulse-Doppler radar and the AIM-120 AMRAAM missile. Sea Harrier FRS 51 (IN-621) at the Naval Aviation Museum (India) in Goa, India. 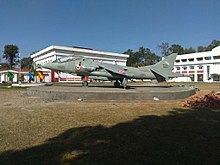 Sea Harrier T Mk.60 (IN-654) at the Rashtriya Indian Military College in Dehradun, India. The Royal Navy still uses Harriers to train Aircraft Handlers who train on the dummy deck at RNAS Culdrose. Although they are unable to fly, they still produce a loud sound to help aid training. Sea Harrier FA.2 XZ457 at the Boscombe Down Aviation Collection, Old Sarum, Wiltshire. Sea Harrier FRS.1 XZ493 at the Fleet Air Arm Museum, Yeovilton, Somerset. Sea Harrier FA.2 XZ494 at the Castle Farm Camping and Caravanning, Wedmore, Somerset. Sea Harrier FA.2 ZA175 at the Norfolk & Suffolk Aviation Museum, Flixton, Norfolk. Sea Harrier FA.2 ZA176 at the Newark Air Museum, Newark, Nottinghamshire. Sea Harrier FA.2 ZD607 at the Defence Storage and Distribution Agency, Bicester, Oxfordshire. Sea Harrier FA.2 ZD613 on the roof of a building at the Cross Green Industrial Estate, Leeds, West Yorkshire. Sea Harrier FA.2 ZE691 at Woodford Park Industrial Estate, Northwich, Cheshire. Sea Harrier FA.2 ZE694 at the Midland Air Museum, Coventry, Warwickshire. Sea Harrier FA.2 XZ459 with a private collection in West Sussex. Sea Harrier FA.2 XZ497 with a private collection at Charlwood, Surrey. Sea Harrier FA.2 XZ499 with the Fleet Air Arm Museum storage facility Cobham Hall, Yeovilton. Sea Harrier FA.2 ZD582 with a private collection at Aynho, Northamptonshire. Sea Harrier FA.2 ZD612 with a private collection at Topsham, Devon. Sea Harrier FA.2 ZD614 with a private collection at Lymington, Hampshire. Sea Harrier FA.2 ZE697 at the former RAF Binbrook, Lincolnshire. Sea Harrier FA.2 ZE698 with a private collection at Charlwood, Surrey. Sea Harrier FA.2 ZH799 with a private collection at Tunbridge Wells, Kent. Sea Harrier FA.2 ZH806, ZH810 and ZH812 with a dealer near Ipswich, Suffolk. Sea Harrier FA2 registered N94422 (formerly Royal Navy serial number XZ439) Nalls Aviation St Mary's County, Maryland. The former Royal Navy Sea Harrier FA2 was purchased in 2006 by Art Nalls, who spent the next two years restoring it to flying condition. In December 2007, it was damaged in a hard landing, while undergoing testing at Naval Air Station Patuxent River and had to be repaired. The aircraft made its first public appearance at an air show in Culpeper, Virginia in October 2008. The aircraft is the only privately owned, civilian-flown Harrier in the world. Hardpoints: 4× under-wing pylon stations, and 1 fuselage pylon on centerline plus 2 attach points for gun pods with a total capability of 8,000 lb (3,630 kg) of payload. Bombs: A variety of unguided iron bombs (including 3 kg and 14 kg practice bombs). ^ "India Retires Sea Harriers". ^ Mison, Graham. "Sea Harrier Down Under". Harrier.org.uk. Archived from the original on 12 December 2010. Retrieved 26 April 2010. ^ "London almost sold arms to BA before war: Astonishing weapons sales plan for Argentina". Buenos Aires Herald. 29 June 2005. Archived from the original on 5 June 2013. Retrieved 4 January 2014. ^ "No V for the Mighty Vanguard". Los Angeles Times. 20 August 1959. Archived from the original on 26 October 2012. ^ "Analysis: UK navy anxiously awaits carriers". United Press International. 3 July 2002. Archived from the original on 2 January 2014. Retrieved 2 January 2014. ^ Jenkins 1998, p. 51. ^ Bull 2004, p. 119. ^ a b c d e f Nordeen 2006, p. 11. ^ a b c Grove 1987, pp. 319–320. ^ Moore 1987, pp. 22. ^ Moore RN, Capt. John E. Warships of the Royal Navy. Jane's Publishing, 1981, ISBN 0-7106-0105-0. ^ a b c Bull 2004, p. 120. ^ "Hawker Siddeley". US Centiennal of Flight Commission. Archived from the original on 25 August 2009. Retrieved 26 April 2010. ^ Ford, Terry (1981). "Sea Harrier – A New Dimension". Aircraft Engineering and Aerospace Technology. Bradford, England: Emerald Group Publishing. 53 (6): 2–5. doi:10.1108/eb035729. ISSN 1758-4213. Archived from the original on 5 April 2012. ^ Flight International 1990, p. 9. ^ a b c d e f Graves, David (2 April 2002). "Sea Harrier cuts leave the fleet exposed The decision to retire the decisive weapon of the Falklands conflict means the Navy will have to rely on America for air support". The Telegraph. Archived from the original on 22 February 2014. Retrieved 1 January 2014. ^ Jenkins 1998, p. 52. ^ Spick 2000, pp. 366–370, 387–392. ^ Bull 2004, p. 121. ^ Jenkins 1998, pp. 51–55. ^ a b c "Navy puts more punch in its Harriers". New Scientist. London, UK: Reed Business Information. 98 (1362): 780. 16 June 1983. ISSN 0262-4079. Archived from the original on 9 May 2018. ^ Hoyle, Craig (9 May 2006). "Harrier high". Flightglobal. Archived from the original on 1 January 2014. Retrieved 31 December 2013. ^ "Captor Radar (International), Airborne radar systems". Jane's Avionics. 30 March 2010. ^ "Pilot shortage hits Harriers". Glasgow Herald. 31 July 1987. ^ Markman and Holder 2000, pp. 74–77. ^ Jenkins 1998, p. 25. ^ "Modern-day veteran". airsceneuk.org.uk. Archived from the original on 6 August 2015. Retrieved 30 January 2015. ^ Wright, Tim (November 2008). "Oldies & Oddities: The Alraigo Incident". Air & Space. Retrieved 4 January 2014. ^ Cenciotti, David (6 December 2013). "[Photo] Man-carrying, under-wing pods capable of being fitted to fighter jets and helicopters". The Aviationist. Retrieved 27 January 2019. ^ "UK test fits Avpro Exint pod on Harrier". Flight International. 23 September 1998 – via Flight Global. ^ "Sea Harrier jets land on autopilot". New Scientist. London, UK: Reed Business Information (2501). 28 May 2005. ISSN 0262-4079. Archived from the original on 29 April 2015. ^ a b Duffner, Robert W. (March – April 1984). "Conflict in the South Atlantic: the impact of air power". Air University Review. Maxwell Air Force Base, Alabama: Department of the Air Force. ISSN 0002-2594. Archived from the original on 10 January 2010. ^ "AV-8B Harrier Operations". GlobalSecurity.org. Archived from the original on 8 June 2010. Retrieved 21 April 2010. ^ Grant 2005, p. 38. ^ Posey, Carl A (1 September 2002). "Air War in the Falklands". Air Space. Retrieved 27 August 2018. ^ a b c "That Magnificent Flying Machine". TIME. 7 June 1982. Archived from the original on 15 August 2007. ^ Dyer, Gwynne (28 April 1982). "Britain Air Blockade? Those Harriers Are Able To Do The Job". Sarasota Herald-Tribune. ^ Posey, Carl (September 2002). "Air War in the Falklands". Air & Space. Archived from the original on 3 January 2014. Retrieved 4 January 2013. ^ Parsons, Gary (2007). "Harrier Heroes". Air-Scene UK. Archived from the original on 4 August 2015. Retrieved 1 August 2015. No-one used viffing in combat – it's very much a last-ditch manoeuvre. It can be useful if the guy behind hasn't seen it before and doesn't know what you're going to do. You can decelerate from 450 knots down to 150 in about three or four seconds, and that is enough to fly people out in front – however, if he sees it coming, all he has to do is go vertical and just sit around on top of you. You end up with no energy at all and he's got all the time in the world to take you out. ^ a b c d e f g h Corum, James S. (20 August 2002). "Argentine Airpower in the Falklands War". Air & Space Power Journal. Maxwell AFB, Alabama: Air University Press. XVI (3). ISSN 1555-385X. Archived from the original on 2 January 2014. Retrieved 2 January 2014. ^ "The rivalry that cost lives". Northern Echo. 5 April 2007. Archived from the original on 4 January 2014. Retrieved 4 January 2014. ^ "Britain's Jets, Bomber Hit Falklands' Airfields; Key Site Called 'Cratered'". Toledo Blade. 2 May 1982. ^ Blanche, Ed (21 May 1982). "British following 'boxer' strategy in Falklands". Kingman Daily Miner. ^ Dunnell 2011, p. 20. ^ Mine, Douglas Grant (15 April 1982). "Argentine troops run the British blockade by air, sea". Miami News. ^ "Harriers lost in the Falklands". naval-history.net. Archived from the original on 2 June 2009. Retrieved 21 April 2010. ^ a b Nordeen 2006, p. 14. ^ "Weather worries pilots preparing for Bosnia Raid". St Louis Post-Dispatch. 18 February 1994. ^ "Igla missile's potent force". 13 August 2003. Archived from the original on 8 February 2018. Retrieved 9 May 2018 – via news.bbc.co.uk. ^ Cook, Nick (1 March 2002). "Plus ca change ..? NATO aircraft are still particularly vulnerable to attack from certain forms of guided missiles". Interavia Business & Technology. HighBeam Research (subscription required). Archived from the original on 4 November 2012. Retrieved 21 April 2010. ^ Kempster, Norman; Kraul, Chris (11 April 1999). "U.S. Sends More Planes to Balkans". Los Angeles Times. Archived from the original on 2 January 2014. Retrieved 2 January 2014. ^ Tegel, Simeon (13 May 1999). "Harriers' cat and mouse game with MiGs". Birmingham Post. HighBeam Research (subscription required). Archived from the original on 4 November 2012. Retrieved 21 April 2010. ^ "British Navy ships arrive in Sierra Leone". New Straits Times. 15 May 2000. ^ Kimmons, Sean (10 February 2006). "Sea Harriers fly with F-15s one last time". Stars and Stripes. Archived from the original on 2 January 2014. Retrieved 2 January 2014. ^ "Last Sea Harriers' flight at base". BBC News. 29 March 2006. Archived from the original on 2 January 2014. Retrieved 4 January 2014. ^ Maggie, Fox (14 January 2000). "Aircraft carrier deal is far from plain sailing". Birmingham Post. Questia Online Library. ^ Cook, Nick (1 April 2002). "Royal Navy: Sea Harrier FA2 STOVL fighters to be retired". Interavia Business & Technology. HighBeam Research (subscription required). Archived from the original on 4 November 2012. Retrieved 21 April 2010. ^ Captain Clapp, Michael (19 February 2010). "It's the bitter truth: We couldn't send a task force to the Falklands today". Daily Mail. UK. Archived from the original on 2 August 2012. ^ "RNAS Culdrose: Royal Navy School of Flight Deck Operations". Royal Navy. Archived from the original on 29 November 2009. Retrieved 24 April 2010. ^ Hoyle, Craig (15 November 2010). "UK defence chiefs stand by Harrier retirement decision". Flightglobal. Archived from the original on 30 October 2013. Retrieved 31 December 2013. ^ Adams, Christopher (25 July 2007). "MoD gives nod for aircraft carriers". Financial Times. Retrieved 2 January 2014. ^ Hoyle, Craig (13 July 2010). "FARNBOROUGH: BAE to ramp up work on JSF production". Flightglobal. Archived from the original on 30 October 2013. Retrieved 31 December 2013. ^ "Securing Britain in an Age of Uncertainty: The Strategic Defence and Security Review." Archived 22 December 2010 at the Wayback Machine HM Government, 19 October 2010. Retrieved 19 October 2010. ^ "School of Flight Deck Operations". Royal Navy. Archived from the original on 19 January 2013. Retrieved 16 January 2013. ^ Smith 1994, p. 97. ^ a b c "Indian Navy to bid adieu to Sea Harrier Fighters". Indian Navy. Archived from the original on 10 May 2016. Retrieved 9 May 2016. ^ a b Hiranandani 2000, p. 276. ^ Kapur, Harish (October 1987). "India's foreign policy under Rajiv Gandhi". The Round Table. 76 (304): 469–480. doi:10.1080/00358538708453838. ^ Tellis, Ashley J. (1985). "The Naval Balance in the Indian Subcontinent: Demanding Missions for the Indian Navy". Asian Survey. Berkeley, California: University of California Press. 25 (12): 1186–1213. doi:10.1525/as.1985.25.12.01p0326t. ISSN 0004-4687. JSTOR 2644281. ^ a b c Hiranandani 2012, p. 154. ^ Hiranandani 2000, p. 287. ^ "Navy grounds Sea Harrier fleet after crash". Times of India. 26 August 2009. Retrieved 1 January 2014. ^ Gandhi, Jatin (25 December 2007). "Sea Harrier crashes, pilot safe". Hindustan Times. Archived from the original on 9 January 2014. Retrieved 4 January 2014. ^ a b "Hover and out: UK Royal Navy retires the Sea Harrier". Flightglobal. 28 March 2006. Archived from the original on 1 January 2014. Retrieved 31 December 2013. ^ "Navy not to purchase used Royal Navy Sea Harrier fighter jets". India Defence. 13 October 2006. Archived from the original on 26 October 2006. ^ "India's Sea Harrier Shortage". Defense Industry Daily. 2 November 2010. Archived from the original on 31 December 2013. Retrieved 31 December 2013. ^ "With third Sea Harrier crash this year, Navy's fighter arm down to 12". Indian Express. 25 December 2007. Retrieved 4 January 2013. ^ Wing Commander R Sukumaran (4 February 2004). "Flying the MiG-29K onto the Gorshkov". Institute of Peace & Conflict Studies. Archived from the original on 25 February 2012. ^ Karnozov, Vladimir (9 July 2012). "MiG-29s Begin Sea Trials Aboard India's New Aircraft Carrier". AIN Online. Archived from the original on 17 August 2012. Retrieved 4 January 2013. ^ Indian Navy Retires Sea Harriers 21 March 2016. Accessed 3 April 2016. ^ "Heralding the Next Gen weapons". Financial Express. 7 February 2007. Archived from the original on 2 January 2014. Retrieved 1 January 2014. ^ Overview, An. "Naval Aviation Museum - An Overview". warbirdsofindia.com. Archived from the original on 11 March 2016. Retrieved 9 May 2018. ^ "Nalls Aviation – Home of the Sea Harrier". Nalls Aviation. Archived from the original on 24 April 2009. Retrieved 21 April 2010. ^ Jenna, Johnson (2 January 2008). "Flying Back in Time, In His Own Warplane". Washington Post. Archived from the original on 7 November 2012. Retrieved 2 January 2013. ^ Scott, Phil. Air and Space. January 2009 "Updates" page 12. ^ Wilson 2000, p. 23. ^ Bull 2004, pp. 220–221. ^ Donald 1997, pp. 215–216. ^ Spick 2000, pp. 391–92, 414. ^ Witney, Nicholas K. J. (1994). "British Nuclear Policy After the Cold War". Survival. London, UK: Institute for Strategic Studies. 36 (4): 96–112. ISSN 1555-385X. "RN Sea Harrier FRS.2 passes sea trials on HMS Ark Royal". Flight International. London, UK: Reed Business Information. 138 (4243): 9. 21–27 November 1990. ISSN 0015-3710. Retrieved 31 December 2013. Bull, Stephen (2004). Encyclopedia of Military Technology and Innovation. Westport, Connecticut: Greenwood Publishing. ISBN 978-1-57356-557-8. Donald, David, ed. (1997). "British Aerospace Sea Harrier". The Complete Encyclopedia of World Aircraft. New York: Barnes & Noble Books. pp. 215–216. ISBN 978-0-7607-0592-6. Dunnell, Ben, ed. (February 2011). "Farewell to the Harrier". Classic Aircraft. Shepperton, Middlesex: Ian Allan Publishing. pp. 16–25. ISSN 2041-2150. Ellis, Ken (2016). Wrecks and Relics 25th Edition. Manchester: Crecy Publishing. ISBN 978 191080 9037. Grant, Rebecca (March 2005). "The Air Force says it wants a STOVL F-35. Is it right for today's combat environment? Expeditionary fighter" (PDF). Air Force Magazine. Washington, D.C.: Air Force Association. 3 (88): 38–42. ISSN 0730-6784. Grove, Eric J (1987). Vanguard to Trident; British Naval Policy since World War II. London, UK: The Bodley Head. ISBN 978-0-370-31021-3. Gunston, Bill and Mike Spick (1983). Modern Air Combat: The Aircraft, Tactics and Weapons Employed in Aerial Warfare Today. New York: Crescent Books. ISBN 978-0-517-41265-7. Hiranandani, G.M. (2000). Transition to Triumph: History of the Indian Navy, 1965–1975. New Delhi, India: Lancer Publishers. ISBN 978-1-897829-72-1. Hiranandani, G.M. (2012). Transition to Guardianship: Indian Navy 1991–2000. New Delhi, India: Lancer Publishers. ISBN 978-1-935501-26-8. Jenkins, Dennis R. (1998). Boeing/BAe Harrier. Warbird Tech. 21. North Branch, Minnesota: Specialty Press. ISBN 978-1-58007-014-0. Markman, Steve; Bill Holder (2000). "MAC-DAC/BAe AV-8 Harrier Vectored Thrust VTOL". Straight Up: A History of Vertical Flight. Schiffer Publishing. ISBN 978-0-7643-1204-5. Moore, Captain John E. (1981). Warships of the Royal Navy. Coulsdon, UK: Jane's Publishing. ISBN 978-0-7106-0105-6. Nordeen, Lon O. (2006). Harrier II: Validating V/STOL. Annapolis, Maryland: Naval Institute Press. ISBN 978-1-59114-536-3. Smith, Chris (1994). India's Ad Hoc Arsenal: Direction Or Drift in Defence Policy?. Oxford, UK: Oxford University Press. ISBN 978-0-19-829168-8. Spick, Mike, ed. (2000). The Great Book of Modern Warplanes. Osceola, Wisconsin: MBI Publishing. ISBN 978-0-7603-0893-6. Ward, Sharkey (2003). Sea Harrier over the Falklands: A Maverick at War. London, UK: Orion Publishing. ISBN 978-0-304-35542-6. Wilson, Stewart (2000). Combat Aircraft since 1945. London, UK: Aerospace Publications. ISBN 978-1-875671-50-2. Hunter, Jamie (2005). Sea Harrier: The Last All-British Fighter. Midland Publishing. ISBN 978-1857802078. Wikimedia Commons has media related to BAE Sea Harrier.